Přebuz, its mountain life, nature and monuments are the place to fall in love with. The tour allows you to peek into the secret nooks and crannies of the old mining. It is not a comfortable path, so prepare yourself for a wet, soft base and take good boots with you. Without fresh air, the dreamy landscape in the mist, bearded grass and sweeping moorland, Přebuz would lose its charm. The sightseeing tour has 13 stops and is 5.2 km long. The mining colony Přebuz (Frühbuß) was formed by the deposits of tin ore. German ancestors seasonally panned kasiterite from weathered rocks and brook sediments since the 14th century. In 1543, a settlement was founded by the deep mining shafts and galleries. Between 1553-1613 the settlement became a town. The ditch (Erbgraben) is the least striking, but the oldest mining monument in Přebuz. It was founded by the Šlik dynasty in the middle of 16th century. Tin mine was opened 1909-1914 under the name of Fresh Happiness (Frischglück), and between 1931-1958 it was called Ritter's mine (Ritterschacht). It reached the depth of 120 m and a lot of depressions remained there which show us the direction of the veins. A small rock hidden in the spruce grove on the left, near the path to Hartelsberg, reveals unique textures of tin-bearing granite. These granites were created when an underground magmatic reservoir hardened 325 million years ago. 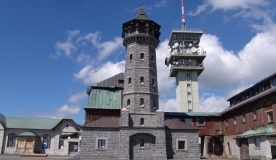 Hartelsberg (Čertova hora, 987 m above sea level) is a magical cone-shaped landmark in Přebuz. It enables you to have a view of the Ore Mountains, Smrčiny, Český les, Slavkovský les, Tepelská vrchovina and Doupovské hory. Manor Mine (Herrenzeche) allows you to peek adventurously into the jagged surface rocks, sunken galleries, dropped basins, water submerges and springs, that were left after the extraction of tin in the 16th – 19th century. The headframe of the main pit (Hauptschacht) was in operation since World War II till 1958 and is now a technical monument. Under the concrete-filled mouth of the pit you can find a flooded labyrinth of corridors to the depth of 190 m.
The processing plant of tin and arsenic ores (1933 – 1945) was the most successful project of its kind in the Western Ore Mountains. The tailings pond (Schlemmteich) contains the waste sand deposits resulting from washing the ores. The Dawn Mineshaft (Gut-Morgen-Stollen) remembers the beginning of mining in Přebuz in the 16th century. The mine was changed in the 20th century into the explosives storage facility. Elizabeth hereditary mineshaft (St.-Elisabeth-Erbstollen) was an important drainage mine in the 16th -19th century. Hammer (Bucherich) in the climb of the road to the church served as a tin ore crushing plant, which supplied the nearby egest plant and ironworks. The Church of St. Bartholomew from the year 1781 is the property of the Roman-Catholic parish in Kraslice. With the dedicated care of the natives, and with the help of the Church, the state, the county, the municipality and citizens, the repair of the church is managed in stages.